Why do certain images seem to capture a genuine response to a subject? There are many reasons why images may appear to embody an authentic response by an artist (i.e. they appear to have "soul"), while others seem to exhibit an artificial display of feeling (i.e. they appear to be fake). For this discussion I will focus on two aspect relating to a print by Eugène Carrière. First there is the drawing style applied. 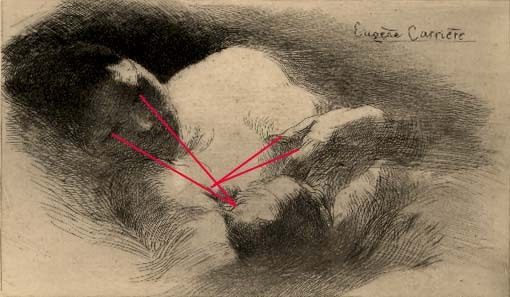 In Carrière’s intimate portrayal of a mother breast feeding her child (see below), the marks employed are sensuous strokes flowing with the contours of the figures. 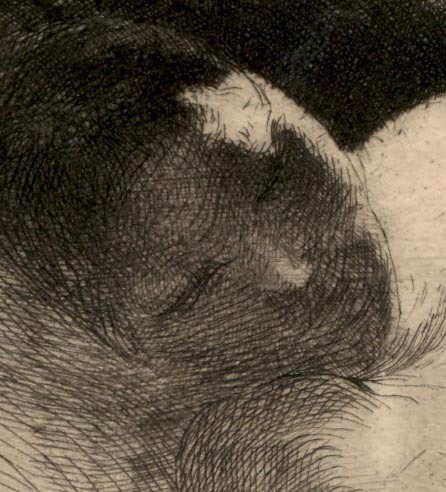 This style is often referred to as a contour style because the marks match the contours of the subject. 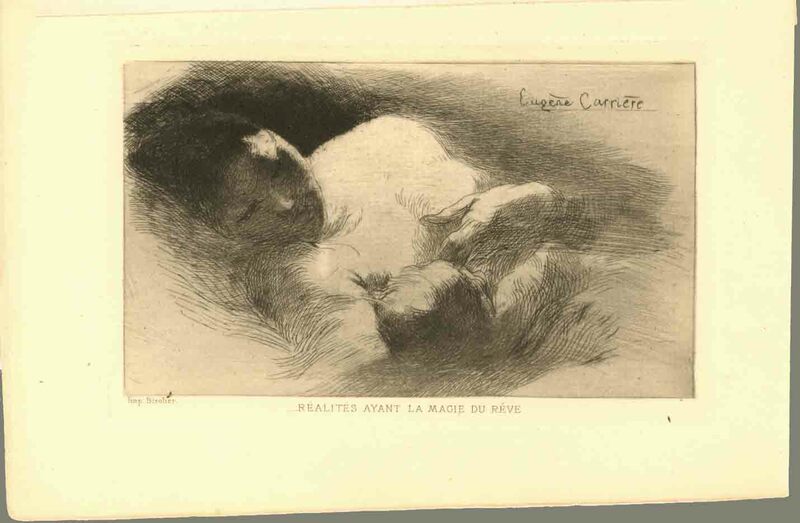 Carrière uses this style to render the subject as if he were portraying the mother and child by a sense of touch (i.e. making gentle exploratory marks to establish the figures’ forms by their contours) rather than by applying a more objective and less sensuous rendering style. In short the drawing style is a haptic approach to rendering and the trace evidence seen in his marks projects the authenticity of a genuine response. Condition: Rich and rare impression in a pristine condition with original tissue guard. I am selling this print for $265 AUD including postage and handling to anywhere in the world. Please contact me using the email link at the top of the page if you are interested or click the "Buy Now" button. A second reason that this image appears to exhibit genuine feeling is linked to a reduction and simplification of visual features to only those elements that are pivotal to the expressed feeling. For instance, see how Carrière has simplified the image to sets of parallel lines (e.g. note the number of parallel lines that match the angle of the woman’s left shoulder and the parallels that match her upper left arm). There is also the reduction of information to draw attention to the visual dialogue between the woman and the child. This elimination of extraneous details by the use of chiaroscuro lighting is one of Carrière’s key attributes (I recommend looking at Carrière’s paintings shown on the web). The principle of keeping information to the barest essentials ensures that the meaningful point of the image is projected, which in this image is a loving intimacy between mother and child. A critical component in articulating this relationship is the position of the woman’s hand. Its placement acts like a seesaw’s fulcrum point and balances the size and distance that the woman’s head is from the child.